Set up your advertising program ONCE and show your ads on any other sites! Useful! Ad Agency allows you to display zones with ads on any other site or even on a newsletter. Just copy the zone code and paste it wherever you want to display the ad. It even works on non-Joomla sites! On any non-Joomla site (HTML, WordPress, etc. ), just copy the code provided and place it inside your site. 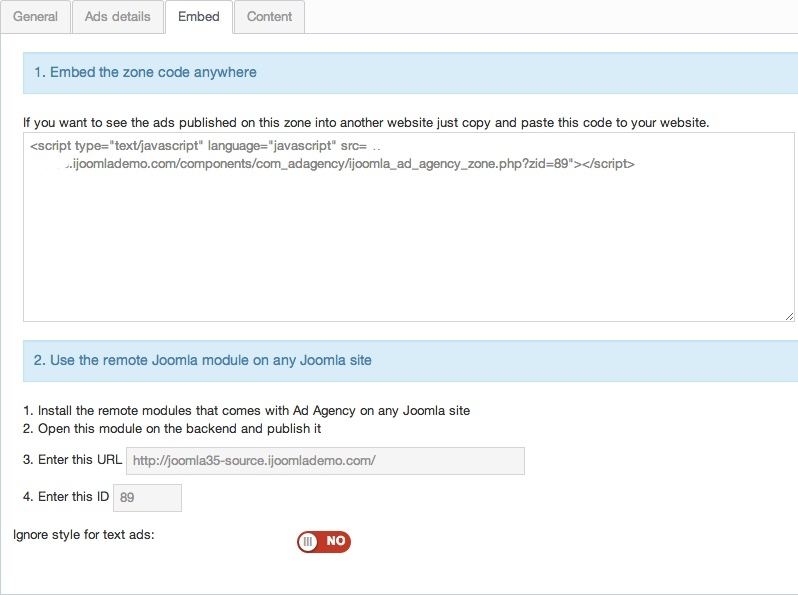 On any Joomla site, install the module included in the package called "Remote" and specify the zone ID and site URL of the site where you have Ad Agency installed. By using one of these methods, you'll be able to display the ads of the selected zone, which allows you to distribute your ads and increase your revenue.